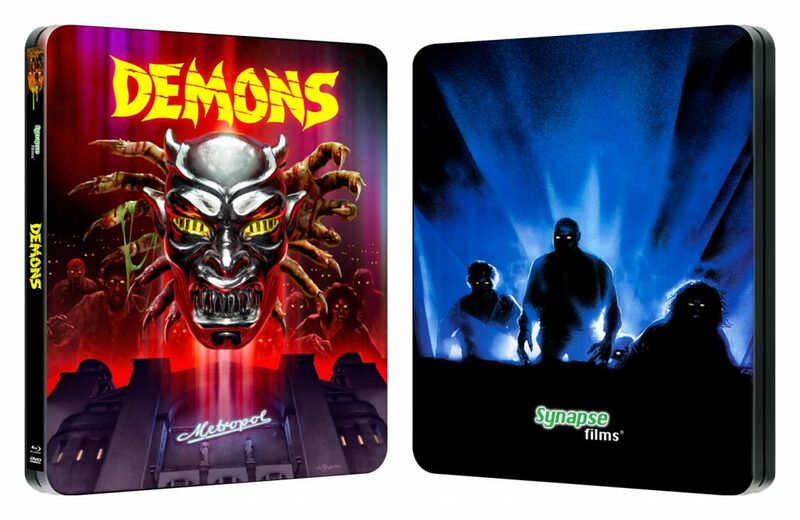 This year, we’ve decided to do Limited Edition Steelbooks for both DEMONS and DEMONS 2, with exclusive new cover art by the amazing Wes Benscoter. While the street date is expected to be around November, anyone who orders the Limited Editions will be getting theirs shipped as soon as they are done and available (we’ll ship them as soon as they come in to our offices, regardless of street date). These LE Steelbooks will NOT be available in stores and 3000 units will be available direct from our website right here at www.synapse-films.com. Once the units are sold out, they will no longer be available. These are ONE PRESSING ONLY items. Once the Steelbooks are gone, they are gone forever and will NOT be repressed. At this time, we have no plans to release these two films in standard non-limited versions but we may do so in the future. – Each Steelbook is Blu-ray packaging sized, and will be a “Combo Pack” containing both a Blu-ray (BD-50) and a DVD (DVD-9) of the feature and extras. – Unlike previous releases, we have the original Italian Language Stereo mix, the “International” stereo alternate dub mix and the original U.S. mono soundtrack! – Audio Commentary Track with Cast & Crew Featuring Recollections from Director Lamberto Bava, Make-up Effects Artist Sergio Stivaletti, Musician Claudio Simonetti and actress Geretta Geretta. – Removable English Subtitles for both the U.S. Language Dub Version, as well as the Original Italian Version. – Collectible Reproduction of the Original Metropol Theatre Ticket seen in the Film. – The transfer is from a new HD scan of the original 35mm negative, in 1080p/23.98fps 1.66:1 aspect ratio [not the same muted colors and weak black levels as previous released versions]. – All audio tracks will be encoded in DTS-HD MA. – Contains the Original Italian Language Mix and the Original English Soundtrack. – Removable English Subtitles for both the English and Italian Versions. We will be adding the two titles to our site within the next week for IMMEDIATE preorder. Once the items go “live” to order in our database, we will post the availability to order on our Facebook page and Twitter feed.